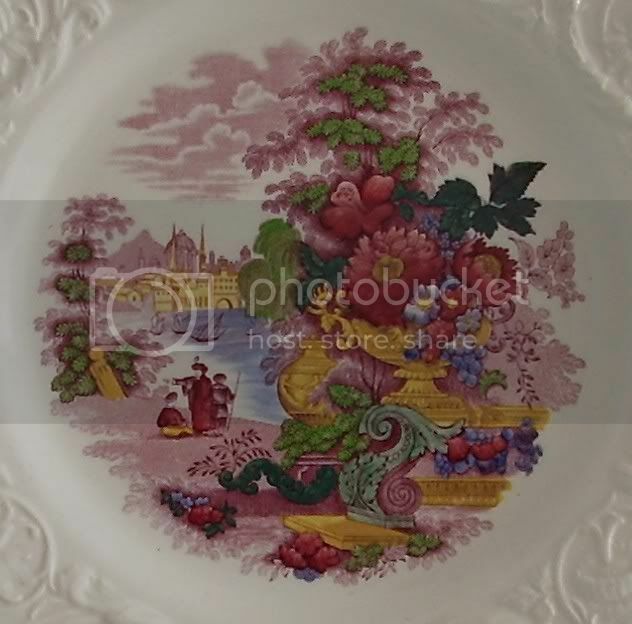 My maternal grandparents had a lovely collection of china and other bits and pieces. They were both born in 1869 and passed away within a few months of each other at age 90 in 1960. They lived next door to us and I remember them vividly to this day, even though I was only 10 when we lost them. They came from another era. My grandmother always wore a high collar with a brooch at her throat. When my grandparents passed away, their possessions were divided between their three sons and two daughters. 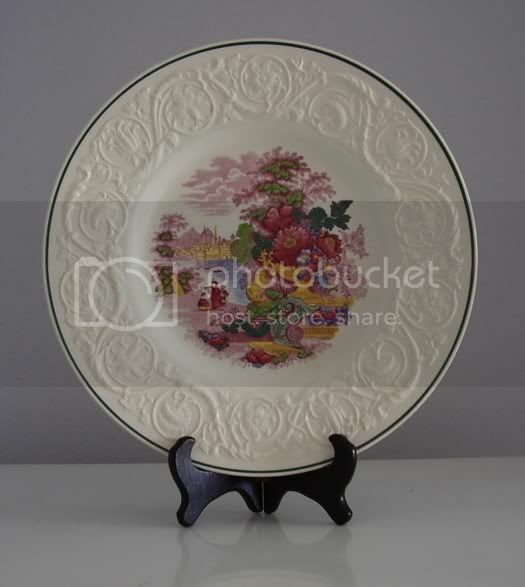 I remember some beautiful objects came into our home at that time, such as three beautiful china plates which Mum kept in her china cabinet. When my mother passed away in 1991, my two surviving brothers (one of my brothers had predeceased my mother) and I took one plate each. Isn't it amazing, that our favourite things are those things from years gone by, that hold a story or a memory of loved ones or our own childhood thoughts. From chairs to china plates to pottery cats, all with a unique story of their own. That's a lovely story, David. I can just imagine you sitting in that cute little chair as a child. It reminded me of my Mum's armchair. 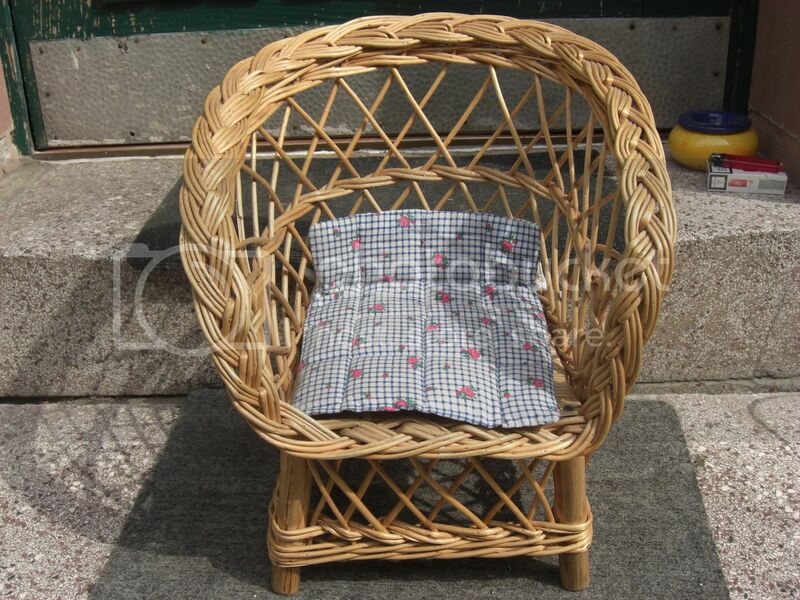 Mum had two of these armchairs and a sofa. She chose the fabric - English Sanderson linen. Both armchairs came to me after she passed away. 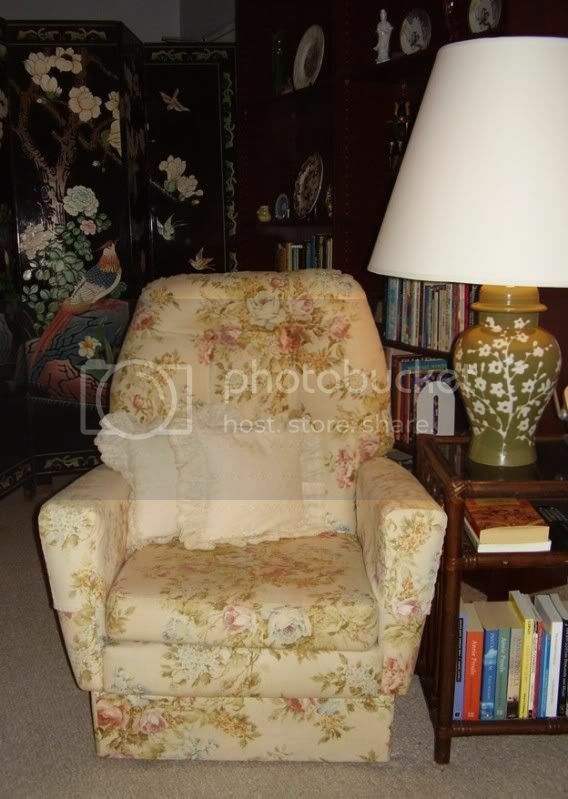 This was Mum's personal armchair, where she would sit to read her newspaper every morning. In Mum's home, it was positioned with a window behind and a lamp in the same position you see here, so there was excellent light for reading, day and night. For me, there is something deeply spiritual about this armchair. Sometimes, late at night, it's very easy to imagine Mum sitting in her chair, right there in the room with me. Hope that doesn't make me sound weird and psycho spooky. I find its presence in my home very comforting. I love your Mom's chair Kerry. And no it doesn't make you sound psycho or spooky. 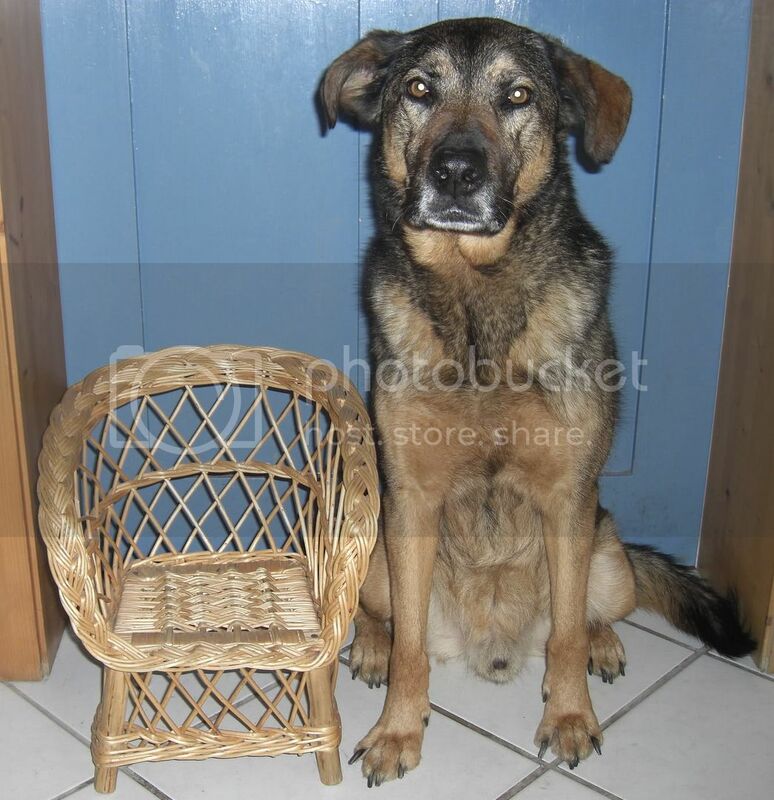 That chair has a lot of sentimental value to you. It's a beautiful chair. Do you ever sit in it? Mom always sat in a certain place on the sofa, over on the far left and she'd always set her coffee or tea on the side table next to it. I remember somebody sitting down in that spot on the sofa just after she died and I felt very angry about it at first. I didn't say anything, but it almost felt like that space of hers had been violated. So I could easily understand if nobody sat in your Mom's chair. I love your Grandma's plate too. It's beautifully painted. The picture on the plate would get my imagination working too. And there's a tremendous amount of detail. It's beautiful! Okay, this is a little bit silly I know. But I'm going to do it anyway. I told you about the sofa and the side table where she always placed her coffee and tea. She placed her Hagrid figurine on that table and she'd often look at it as she sat (and later laid) on the sofa. She kept it there until she was finally taken to hospital for the final time in early September. Hagrid came with her and he watched over her until she breathed her last on September 22, 2003. So anyway, he's just a cheap plastic toy, but Mom loved it. And because of that, he's very special to me too. Oh, and I noticed this picture is out of focus after I uploaded it to Photobucket. It looks like my camera focused on the bird figurine just behind it. I should have caught that when I took the picture. 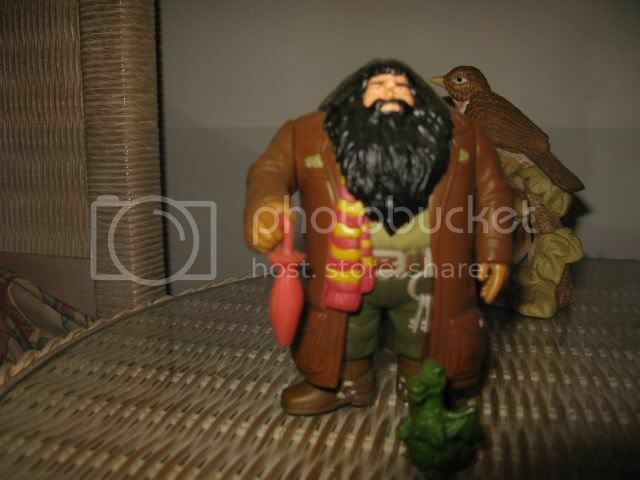 Anyway, I think you can see Hagrid clearly enough. He's about 3 or 4 inches tall. This is the most beautiful thread. I'm going on a trip tomorrow. When I come back, I hope I remember to share here. I love your mothers' plants, David and Kerry. What a lovely thread. I love Sue's painting from her cousin, it's stunning. I also love the sleeping cat, all the china, the chrystal firgurines and all the other stuff. Re the crystal figurines: Swarowski is a well-known company here, it's from Austria. My kids have some crystal figures. And I have some special china, too. It's Meißener Porcelain, which is quite expensive, especially the old pieces. I inherited it from my father's family and have many smuggling stories about it. Meißen is in the eastern part of Germany, the former GDR. My father was from there, he fled in the late 50ies. Anyway, it was forbidden to bring Meißener Porcelain out of the state of the GDR, so all the porcelain I have from my father's family was smuggled, every single piece. 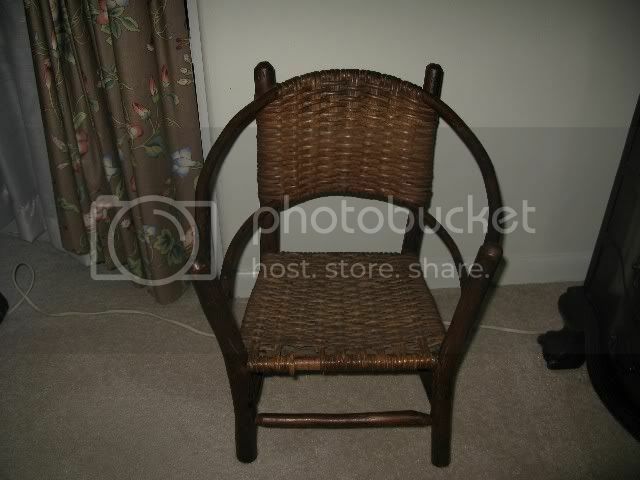 Actually I think this is a doll chair. It is only about 2 feet tall and it is made out of wicker. However, when I was little I would sit in it and watch cartoons. I would either sit in that little chair or in my Mom's laundry basket. Don't ask me why I sometimes sat in a laundry basket, but.... well....there it is. Anyway, the chair is very old. It was made in the mid 1800's (1860s I think) and it has been handed down in my family for generations. It is also very strong. The chair is in perfect condition. There are no cracks or splits in the wood and the wicker is perfectly intact. They made things really well back then. OMG David, I have a similar chair, and it's also one of my favorite things . I, too, sat in it when watching TV (and I also loved to sit in the laundry basket, I think all children do)! My parents bought it for me when I was small. I have pictures of me as a kid sitting in it . Meanwhile the chair survided the use of four children (me and my three kids), and is still intact. I even have the cushion, it's still the original one. The chair was amiss for years. My father swore (swore to the high gods and everything which was sacred to him) he didn't have it and assumed that my mother took the chair with her when she moved out. My mother swore that she didn't take it and never had it. So the chair stayed mysteriously disappeared for years. After my father had died I found it in the attic when I dissolved his household. It was neatly packed away, wrapped in a sheet and additionally covered with a plastic foil, standing in the farest corner of the attic. Other stuff was standing in front of it, so he must have overlooked it when he searched for it. I was really happy to find it. Yes, it is a beautiful thread.......not just the pictures of all these lovely thngs, but the stories that go with them. David, dont ever think you are weird or physco for the feelings you have around these items of your mums. It shows with true certainty, that she is with you always. You are very fortunate to have so many memorable items. OMG Chrissie, that chair is tiny.....either that, or you have a giant dog. ....who is very handsome, by the way.